June 25, 2018 by Enxhi 3 comments on "How to Make Your Own Website Logo: Free Tools to Use"
Welcome to my tutorial on how to make your own website logo! Whether it is a small e-commerce website or a giant like Amazon or Alibaba, you would’ve noticed that all of these sites have their logos. Not only in websites but if we talk about physical businesses with brick and mortar structures, you will see that all of them use a logo for their business. If we look at Apple, they also have their logo. Similarly, every business uses a logo to represent themselves. Just like that, in the online world, you need a logo for your website which will represent it. It doesn’t matter if your website is related to business or not, as long as it is open to people, you need a logo for it. Today we are going to talk about how to create text-based logos for your websites by just using some free tools available on the internet. The process will be easy to grasp for you and will help you give your website a representation. Creating a logo is something which you create when you firstly create your website and you can keep it for a long time on your website. Then, with time, when your website starts to develop you can update it. Even the most strong and famous brands update their logo after some time. How much time does logo creation take? It entirely depends upon the logo that you are designing. If you are going for creative and highly professional logos with images made from scratch, then you might want to use Photoshop. But, Photoshop is a complete and complex software that will consume a lot of time maybe hours. But here I am going to tell you about text-based logos which you can create in just minutes. The logos will look amazing on your website especially if you are just getting started with your site. I suggest that you try to use these tools that I am going to tell you about, to create your logo. These logos will save you a lot of time and money, which you would have paid to a professional logo designer. There are a total of one hundred and ninety-one font styles on this website, and this is just page one out of fifty-six pages which means you will have plenty of styles to choose from. At the end of the page, you will find the button for next page. You can change the pages until you see a style of your preference. I am selecting the “Gun Metal” font style for this tutorial and because I also like this one. Just take your mouse pointer over the text style and click it. From the text size, you can adjust the size of your text to make it bigger or smaller. As you can see that after applying the shadow, the text now has a shadow appearing behind it. I have used 16 points for the horizontal shadow that is “X” and 10 points for the vertical shadow that is “Y” but you are free to choose according to your preference. Once done, click on create logo button and a new page, containing your final logo will open. Right-click on that logo and then click save image as, choose your desired location and save the logo. That’s it! Your first text logo will be created just like that. 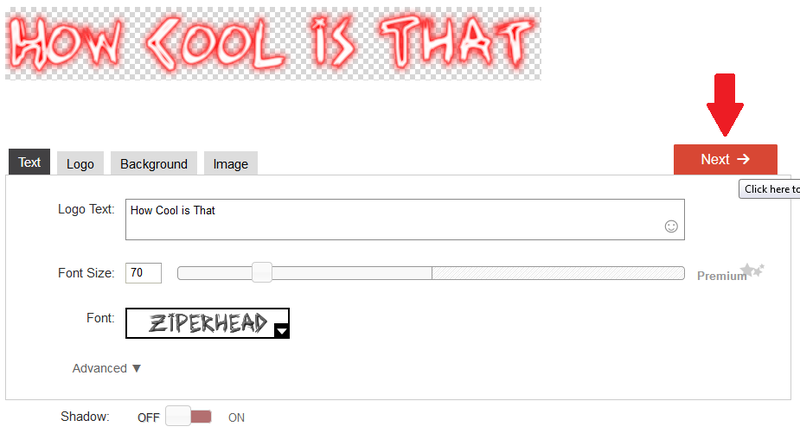 The only drawback with Cooltext.com is that it is pretty basic and you cannot do much alteration with your text logo. But the second website which I am going to share with you is very open to alteration and has a decent amount of variations for every single text style. Open your browser and go to flamingtext.com, a website will open where you will see a lot of text styles. There are a total of 37 pages on this website and each page has different styles of fonts. Select the font of your choice and click on it. 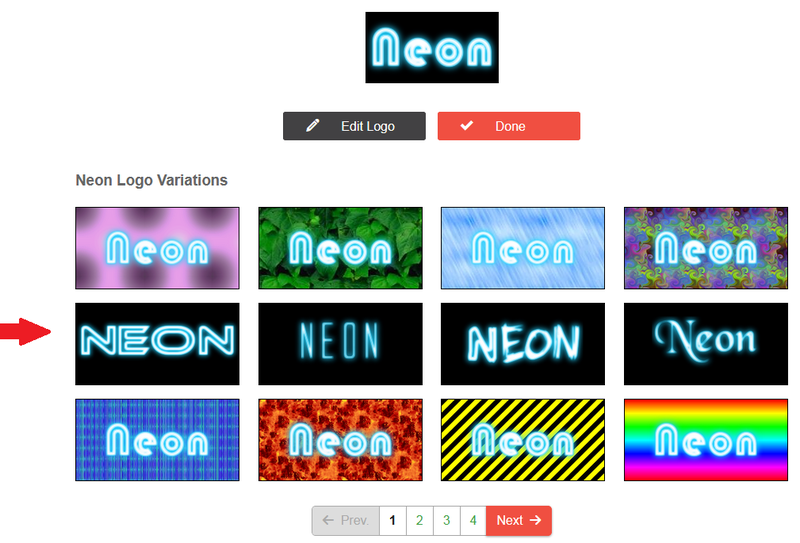 I am choosing the “Neon” font. You can change the font size according to your preferences. You can also change the font from the “Font” menu beneath the font size. Moreover, you can add the shadow, by turning the “Shadow” switch to on. Once you are done with the coloring, you can choose the background for your text from the background section. There are various backgrounds available, and you can check each of them until you find the suitable one. For now, I am selecting the transparent background, because I just want the text. Once the page with your logo appears, right click on the logo, then click on “save image as” and then select the location to save your image, and that’s it! Both of the websites are useful in their own way, and ultimately, it comes to the preference of the user. The process of text-based logo creation is straightforward and time-saving. You just have to do as I have shown above and you will have your own text-based logo. You can use it on your web page’s header or footer and also to help in the infographics of your blog posts. One thing that you need to do is refrain from putting too much of these text-based images on your website. Visual representation in blog posts is necessary, but it should not be done up to the point where it seems annoying to the readers. After all, creating a logo is a creative task, you have to be inspired in some way at the moment when you are creating it, just create something which seems good for your eye. A logo will change the appearance of your site, making it seem like a more authority site. If you want to learn new guaranteed ways which will add up to your website and increase conversions, you can create a free account on Wealthy Affiliate, it basically offers you everything you need to know about internet marketing from A to Z. 3 Comments on "How to Make Your Own Website Logo: Free Tools to Use"
Your post is awesome.You provide all information about logo design.You post is helpfull.Can you suggest me one best site for logo designing?